I have a tattoo of a boar in some kind of fake-medieval Russian style. I got it because the wild boar is something like my totem animal. To me, wild boars have always been brave, strong, straightforward and - not least - feared and hated. As with wolves, European hunters in the previous centuries would orchestrate mass slaughters of wild boars, telling themselves that the boars were embodiments of Satan. Hunters generally fear boars, because they are very dangerous to hunt due to their strength and intelligence. 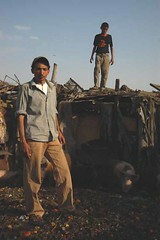 "Unlike the PIG, the boar has been a companion to the warrior. In the wild, the boar is an aggressive animal and unrelenting in its attack. Norse warriors would use the image of the boar for decorative purposes as well as its actual teeth for various forms of adornment. In ancient Japan the war god himself was sometimes depicted as a boar. It was a sacred animal for the Celts for whom it symbolized military strength and goodness." 1. My tattoo, inked by Pete at Exotic Tattoo in Lund, Sweden, in 2001. I modified the design myself from an illustration in a Russian children's book on history, and Pete added the gray shades. 2. Osaya's tattoo. Follow the link and you'll see a photo collage on how it was made. 3. Jay's pictish boar tattoo. Jay says: "I think it goes well with my kilt." 4. An Asian-inspired tattoo design with a moon, an owl, a gingko tree and a Chinese sage riding a boar, by Josh Roelink from Tatudharma in Sydney. Via DesignHub. mpiette83 has a cool tattoo of a warthog on his chest. 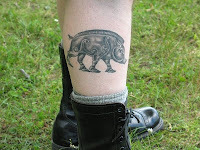 WeAreTheEnglish.com entertain Anglo-Saxon nationalism, and also traditional tattoo designs, including boars. They write: "Of all the animal symbols that were revered by the Anglo-Saxons it is quite possibly the Boar that was revered above all others. It was used as a symbol of protection and because of this it can often be found on Saxon War Helmets. In the old English epic poem Beowulf you can read about warriors going into battle with Boar crested helmets and many have been found buried at English archeology sites. It was believed that the image of the boar would bring protection to its wearer at times of war and they would be infused by its strength, power and ferocity. The boar was also closely connected to the Anglo-Saxon god Ingui. As well as the protection offered by the image of the boar, at times of battle those wearing this symbol believed that Ingui would watch over and protect them above all others." "A wild boar or its head - a tattoo used by female criminals, who have spent a prolonged time in prison and engage in lesbian love. The wild boar is a symbol of power and masculinity, and a woman with this tattoo has taken on the role of the man." In other words, I have a classic butch tattoo.